Prius Prime makes charging at home simple and more convenient than ever. In fact, there's no need for special equipment - the charging cable is included, and it takes less than five and a half hours to get full charge using a standard household outlet. And charge scheduling allows you to schedule your charge in advance, allowing you to take advantage of off-peak electric rates. You can forget about range anxiety - when your battery is low, and with your gas in your tank, Prime can reliably get you where you're going with its proven gas hybrid engine. Get more at glance. The available color Head-Up display (HUD) uses aircraft-inspired technology to project important information about your drive directly in front of you on the windshield. The color display can show your speed and energy monitor info, while also giving turn-by-turn directions, so you can stay focused on what's ahead. The customizable 4.2 inch. color dual Multi-Information Display (MID) screens let you keep track of Prime's vitals at a glance. Just use the steering wheel-mounted controls to keep track of real-time driving data, up-to-date fuel economy, energy used and more - all while keeping both hands on the wheel. Prime offers three driving modes so that the driver stays in control: EV auto mode, EV Mode and HV mode. EV Auto Mode intelligently selects between EV and hybrid driving based on demand and driving conditions to optimize your efficiency. EV Mode relies on EV driving to maximize efficiency, all the way up to full highway speeds. HV Mode efficiently combines the gas engine and EV power from the HV battery to drive Prime. Get ready to take everyone by surprise. 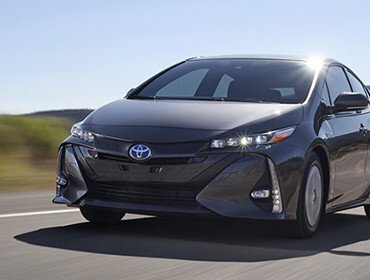 The 2017 Prius Prime is here with a striking new look that will shake up the status quo. Its sleek shape has been engineered to cheat the wind and win over the crowd. 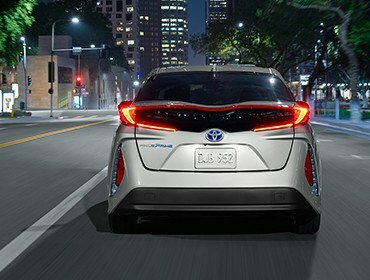 Stylish front and rear LED lighting helps this hybrid make a powerful statement. And available 17-in. alloy wheels ensure that this hybrid rolls in style every time it hits the streets. Prime brings style to every corner. Available 17-in. 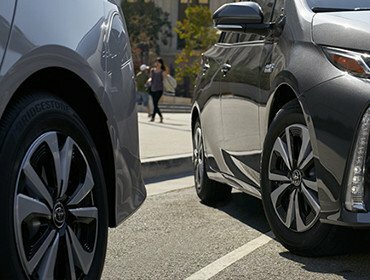 alloy wheels add the right amount of attitude and ensure that all eyes are on this Prius, wherever it goes. Prime's loaded with innovative tech that you just can't miss. Its available 11.6-in. HD multimedia display is Toyota's most impressive yet, intuitive pinch, zoom, tap and swipe gestures create a familiar smartphone-like experience while giving you easy access to the features that matter most. So whether you're using the available Entune App Suite to plan your next night out, or using the navigation to help you get there, you've got the power to do it all, with just a tap. Prime's cabin features a modern design and premium materials throughout. Thoughtful interior touches delight the senses while smart tech brings convenience and innovative thinking to every trip. Prime's front seats feature deep bolsters for body hugging comfort. When roads twist, these seats help keep you in place for extra confidence behind the wheel. Prime's 60/40 split fold-down rear seats fold to maximize cargo space and versatility. With 19.8 cu. ft. of space, the largest cargo capacity in its class, it will help you enjoy even more room – and more adventures. Take control and use your smart phone with the available Prime Apps, including the Remote Climate app. This way, you can check your Prime's current temperature setting and change it to your liking – all before you even get in. When Prime is plugged in, the power used for Remote Climate is pulled straight from the grid so you're battery keeps its charge. Now your comfort is always within reach. Pre-Collision System with Pedestrian Detection helps keep the road safe by detecting a vehicle or a pedestrian in certain situations. By combining millimeter-wave radar with a camera capable of shape recognition, the system provides an audio/visual alert warning you of a possible collision with a pedestrian under certain circumstances. If you don't react, automatic braking support helps mitigate the potential for a collision. Full-Speed Range Dynamic Radar Cruise Control (DRCC) takes cruising to the next level. Using forward-sensing radar technology and an intelligent camera, the system can detect the speed and distance of the vehicle traveling directly ahead of you and adjust your speed accordingly. It works in traffic, as well, helping you maintain a present following distance, slowing when the present distance shortens, then accelerating back to your original cruising speed when the road clears. When in reverse, Prime's standard integrated backup camera uses a wide-angle lens to display a larger viewing area. Clearly marked lines on the screen show the distance guidelines, giving you more confidence to get out of any spot – tricky or not. Prime enhances visibility and helps make nighttime driving safe. The Automatic High Beam (AHB) system uses a camera to help detect oncoming vehicles as far as 2,000 feet away and, depending on the circumstances, it can automatically switch the high beams on and off, helping make it easier for other drivers on the road.